Guatemala | Cool Kid Facts . Guatemala is located in Central America. Mexico and Belize lie to the north of the country, while El Salvador and Honduras are south. 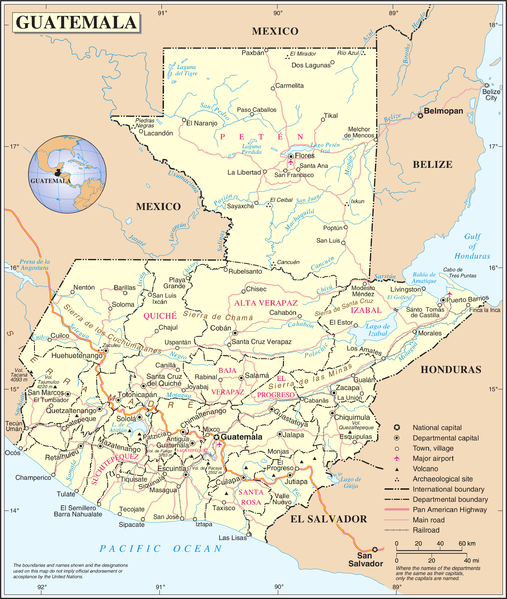 Guatemala also has a border with the Caribbean Sea to the East and the Pacific Sea to the West. The capital of Guatemala is Guatemala City. The population of Guatemala is approximately 14,100,000 people which is roughly twice the population of Arizona. The Mayan civilization were present in Guatemala. They built their cities as early as 18,000 BC and the ruins of the temples can still be seen today. The Tikal National Park homes 3,000 Mayan buildings, dating from 600 B.C. to 900 A.D. and is the largest tourist destination in Guatemala. Chichicastenango Market is home to a native market selling fabrics, textiles, clothing, local crafts, fruit and vegetables. These markets attract locals and tourists, and often host festivals, feasts and parties that everyone is welcome to. Monterrico is a volcanic beach with black sand, where you can take part in saving a sea turtle when visiting a local sea sanctuary. You can help care for the turtles and then release them back into the safety of the ocean when they are ready. The Santa Catalina Arch is a huge tourist attraction. It was built in 1694 for nuns as they had taken a vow of seclusion. The nuns lived on one side of the Arch and taught in a school on the other side. The arch was built so the nuns did not have to cross the street and see anyone. The city of Antigua was destroyed in an earthquake in 1773 but the Arch remained. Today, it still stands and tourists flock to see it. Like most Central America countries, tortillas are common in Guatemala. These are made with corn or wheat and eaten with most meals. A national dish is Tapado, which is a combination of coconut, banana, fish, herbs and vegetables. However, the most common crop found in Guatemala is the coffee bean. These beans are world famous and are exported throughout the world. Guatemala is home to the first chocolate bar. 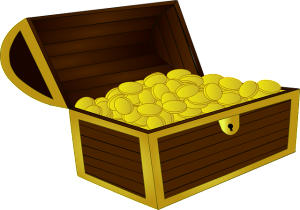 The Mayan civilization invented the chocolate bar using cocoa beans, a product that is now world famous. The world’s largest supplier of the green precious stone Jade is Guatemala. This jewel is exported throughout the world. Guatemala has approximately 30 volcanoes, 7 of which are active. Volcano de Fuego was the last Volcano to erupt in Guatemala, erupting twice in one year in 2018, killing at least 190 people and leaving 256 people missing. 14% of the Guatemalan population live on less than US $1.25 a day. What is the name of the capital city of Guatemala? What US State has a population roughly half the size of Guatemala? 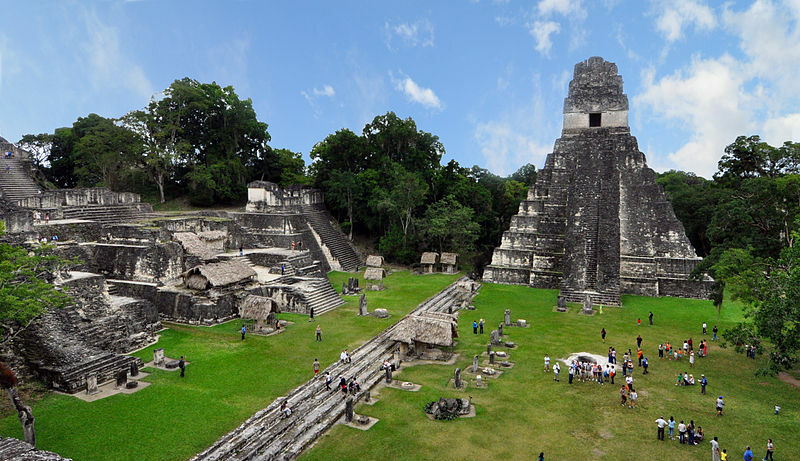 How many Mayan buildings can be found in the Tikal National Park? What is Monterrico famous for? 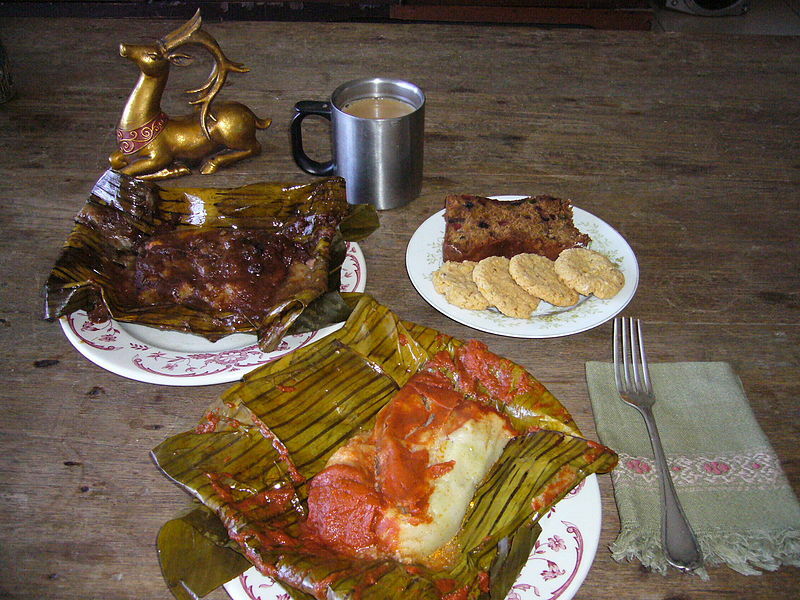 What famous food first originated from Guatemala? What is the world-famous crop that is grown in Guatemala and exported around the world? What is the name of the precious stone found in abundance in Guatemala? What was the name of the last volcanic eruption in Guatemala and when did it occur? What percentage of people live on less than US $1.25 a day? A black sand volcano beach where you can save sea turtles.